... poetic, intense account of the third movement of Chopin's Sonata [in B Minor] that resonates deeply. "Chemists Making Music", an ongoing project sponsored by the ACS Division of the History of Chemistry and the Chemical Heritage Foundation and organized by Vicki Bragin and Jeff Seeman. Most recently, a concert was held in San Francisco during the 232nd National Meeting of the American Chemical Society. Dr. Elaine Bearer, biochemist-composer from Brown University, composed a work especially for Bragin to perform for this occasion. In addition, Bragin invited the Caltech Chamber Music Ensemble to perform works by Alexander Borodin, a chemist, and by Sir Edward Elgar, an amateur chemist. Although Caltech has a worldwide reputation for its science, math, and engineering programs, less known is that it has had an outstanding and thriving chamber music program for decades, led by cellist Delores Bing. The students who performed at this concert were chemistry majors. 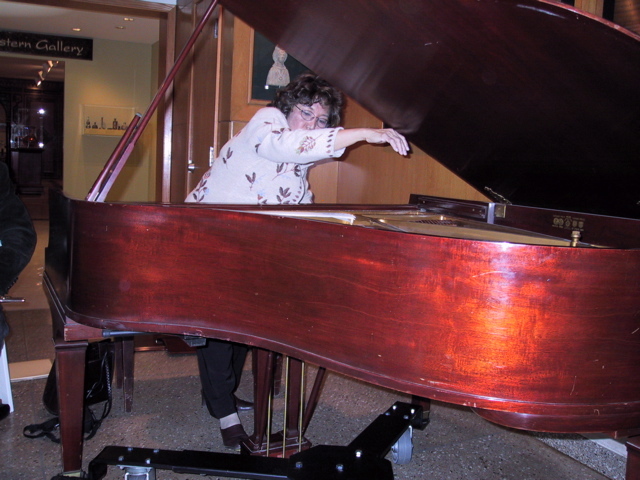 Spring 2006: "Women for All Seasons": a concert of chamber music by women composers (Rebecca Clarke, Joan Tower, Clara Schumann) held in conjunction with an exhibit of works by women artists at the Huntington Museum of Art. In collaboration with the Montclaire String Quartet. Two performances: March 10, Kanawha Presbyterian Church, Charleston; March 12, Huntington Museum of Art. August 30, 2005 at 5:30 pm: Special solo concert of works by Beethoven, Borodin, and Chopin. A brief talk by Bragin on Borodin as chemist, composer, and a staunch supporter of academic freedom, especially for Russian women, preceded the performance of Borodin's works. 230th American Chemical Society Conference at the Washington, DC Convention Center. Sponsored by the ACS Division of the History of Chemistry and by the Chemical Heritage Foundation. March 20, 2005: 20th Century Chamber Music Concert, featuring works of George Crumb, Ned Rorem, and Maurice Ravel. In conjunction with the exhibition, Graphics by 20th Century Masters, at the Huntington Museum of Art. April 25, 2004: From the Tri-State Music Studios and Beyond. In conjunction with the exhibit Exploring the Great Outdoors a concert was held featuring talented precollege students from the Tri-State Area and neighboring cities. October 11-12, 2003: The First Huntington Museum of Art Composers' Festival was produced by Bragin in conjunction with Exhibition 280/Parameters, a juried art show featuring the works of visual artists from West Virginia and the contiguous states. At the festival concert composers currently resident in the state were invited to showcase a composition of their choosing. Spring 2003: "Mostly American Concert" in conjunction with an exhibit of American Art from the Huntington Museum of Art collection, which was to travel to various museums in the country.